Lierac Bust Lift Anti-Aging Recontouring Cream 75 ml cream order online. A complete anti-aging cream with a reshaping texture that combines a firming complex of hazelnut oligopeptides and a Japanese mandarin extract with depigmenting properties, to tighten the skin covering and ensure smoother, flawless skin. This generous cream intensely firms the skin. -Firming complex of hazelnut oligopeptides: used for their anti-slackening properties. -Depigmenting extract of mandarin: used for its ability to help regulate melanin, the pigment that causes the appearance of dark spots. -Hyaluronic acid and AHA: a synergy that instantly and visibly smoothes the skin. Helps reshape the breasts. 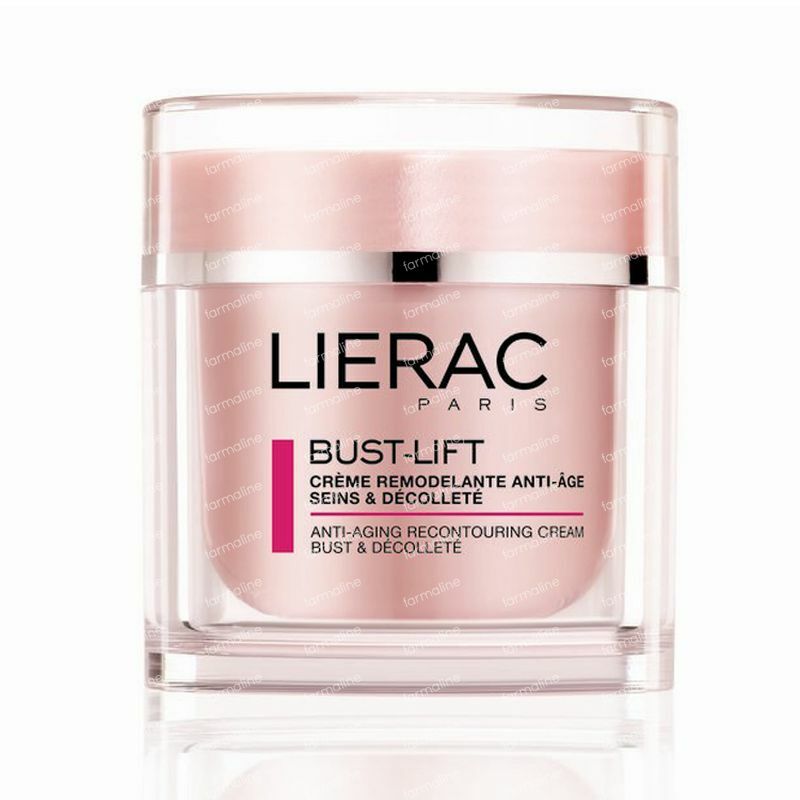 Smoothes and moisturizes the décolleté. Helps prevent and reduce the appearance of dark spots. Use as an intensive treatment for at least 4 consecutive weeks. For best results, massage all over the décolleté up to the shoulders and the base of the neck, working as if to trace an “8”. TRIGLYCERIDE. CETYL PALMITATE. MYRISTYL ALCOHOL. HYDROLYZED HAZELNUT PROTEIN. DIMETHICONE. MINERALE. PEG-100 STEARATE. SODIUM POLYACRYLATE. CYCLOHEXASILOXANE. HYDROGENATED POLYDECENE. GLYCOLIC ACID. MYRISTYL GLUCOSIDE. NYLON-12. CITRUS UNSHIU PEEL EXTRACT. SODIUM HYALURONATE. TROMETHAMINE. SODIUM LACTATE. DIMETHICONOL. CITRIC ACID. SODIUM PCA. PPG-5-LAURETH-5. MENTHOXYPROPANEDIOL. XANTHAN GUM. LACTIC ACID. MALIC ACID. PROPYLENE GLYCOL. PYRUVIC ACID. TARTARIC ACID. PPG-1-PEG-9 LAURYL GLYCOL ETHER. SODIUM CITRATE. TETRASODIUM GLUTAMATE DIACETATE. BIOTIN. SODIUM HYDROXIDE. PHENOXYETHANOL. METHYLPARABEN. ETHYLPARABEN. BUTYLPARABEN. TITANIUM DIOXIDE. CI 14700 / RED 4. CI 17200 / RED 33. PARFUM / FRAGRANCE. Tenho 40 anos e fui mae ha 20 meses. passei a uasar diariamente, coloco todas as noites. os meus seis recuperaram a firmeza. 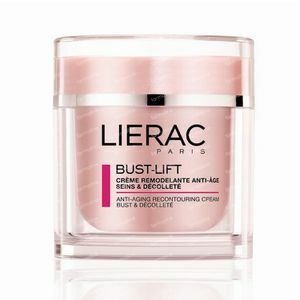 Recomendo este produto associado ao Lierac Bust Lift Beautifying Smoothing Spray. This product pleases me a lot, easy to apply and smells amazing. 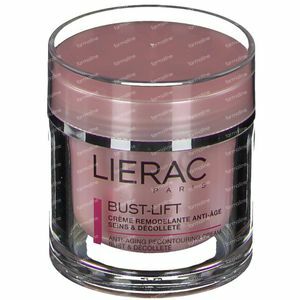 The lifting effect is great, skin feels smooth and fresh. The cream penetrates quickly and you should massage it in gently. Very nice fragrance and after 15 days I do see a visible result.